Early morning has developed its own beat along Chicago’s new Bloomingdale Trail. Recreational runners, with the rhythmic pitter-patter of their trainers on a rubberized track, create a subtle but omnipresent bass line. Bicyclists, likely on their way from home to work, add staccato clicks as they ratchet into higher gears for smooth sailing above city streets. Near the middle of the trail, just west of the bridge that spans Milwaukee Avenue, the “L” rumbles overhead, wheels clanking over rails repetitively like a high hat. There are other sounds, too—lone voices of people yammering into cell phones, the natural ebb and flow of conversations in a variety of languages, and the laughter of children playing in schoolyards below. For years, the 2.7 miles of elevated railroad tracks bifurcating Chicago’s Logan Square, Humboldt Park, Bucktown, and Wicker Park neighborhoods sat dilapidated and quiet, an eyesore on the Windy City’s northwest side. Now, however—thanks to a two-year, US$95 million public-private rehabilitation that ultimately will comprise the Bloomingdale Trail and six ground-level parks—the old rail line has become a vibrant lifeline connecting communities. The trail and parks together represent an overarching project known as The 606—named after the three digits that all Chicago zip codes share. Though one of the parks is still under construction, the bulk of the project opened to the public this summer. Today, The 606 is a short and easy trip (on foot or by “L”) from all downtown hotels. And even in the chill of winter, it’s worth a day trip to explore. Without question, the Bloomingdale Trail is the centerpiece of The 606. Think of it as Chicago’s version of New York’s High Line. The new trail runs west to east just above Bloomingdale Avenue, perpendicular to the shore of Lake Michigan (but about three miles inland). On the western side, it begins just east of the Metra yards at Ridgeway Avenue; on the eastern side, it ends in the shadow of the Kennedy Expressway overpasses, at Ashland Avenue and Walsh Park. In between, the trail runs at a relatively flat grade in the 100-year-old concrete embankment of the old Bloomingdale rail line, stretches across 37 bridges, and sits an average of 17 feet above the street. This elevated perch gives trail-goers commanding views of surrounding neighborhoods—Humboldt Park and Wicker Park to the south, Logan Square and Bucktown to the north—as well as a fascinating (and sometimes voyeuristic) peek at rooftop decks and patios above and below. It also gives people a traffic-free thoroughfare for traveling through some of the city’s busiest streets. The Bloomingdale was undeniably built for travel. The paved surface is 14 feet across and includes two five-foot bike lanes in both directions, each flanked by one two-foot lane of synthetic rubber (for runners and walkers) on either side. In winter, when Chicago weather can be frigid and blustery, the city plows snow and ice off the main trail, making it one of the most popular routes for commuters who wish to avoid the slushy streets below. In the summer, when the Windy City is warm and dry, the Bloomingdale is bustling all day long. Viewfinder Tip: Look for original public art along the Bloomingdale Trail; some examples include a solar observatory at the western terminus and a billboard near the Milwaukee Avenue bridge. The Bloomingdale rail line—which was owned by the Chicago, Milwaukee, St. Paul and Pacific Railroad Company and originally served a small but powerful manufacturing industry on the northwest side—was elevated more than 100 years ago. Trains ran on the line until the early 1990s, when all traffic ceased. Plans for The 606 began shortly after that; in the late 1990s, a proposal to convert the Bloomingdale Line into public space appeared in Chicago’s city bike plan. Then, in 2003, the city’s Department of Planning and Development held a series of public meetings to determine how to bring new open space to Chicago’s park-starved northwest side. Eventually, this spurred the formation of the Friends of the Bloomingdale Trail, a group of residents who would champion the effort. This group involved the Trust for Public Land (TPL), which is credited with bringing together a coalition of city and civic organizations to move the project forward. Eventually, even Chicago Mayor Rahm Emanuel got behind The 606, making it one of his campaign promises in the 2011 election. So far, funding for The 606 has been secured in spurts. The first US$50 million came from the federal government, as part of funds from the Federal Highway Administration’s Congestion Mitigation and Air Quality Improvement Program. An additional US$5 million came from city, county, and state coffers. 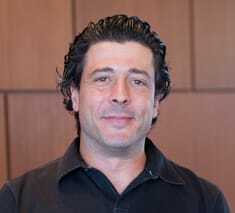 The rest—US$20 million to date—has come from private donors. Another US$20 million is yet to be raised. Since breaking ground in August 2013, most of the attention has been paid to the embankment—the giant concrete bathtub in which the trail sits. Much of this structure was in great shape from the early 1910s, but TPL worked with separate design and construction firms to shape and update it in certain spots. 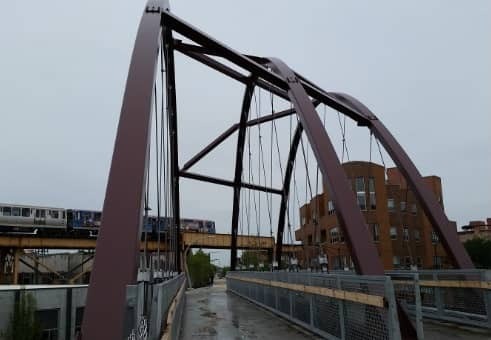 Another focus was the crossing at Milwaukee Avenue; to replace the old overpass, the same design and construction firms crafted a brand new bridge with a weight-bearing support structure on top. Today this bridge is perhaps the most recognizable design feature of the entire trail; it is visible from blocks away and is one of the only spots on the trail with unobstructed views of the Willis Tower and the skyline downtown. It’s also a great spot from which to look west as the “L” thunders by on tracks that arch overhead. TPL’s rehabilitation efforts included the trail and all of the adjacent parks, too. One of these parks is still under construction: a four-acre park at the western trailhead. Another park, Walsh Park, was expanded this summer. In addition, the project includes four “pocket” parks. These comprise ball fields, basketball courts, and play structures, and they connect to the trail with paved (and sometimes serpentine) wheelchair-friendly ramps. One park, the Julia de Burgos Park, is next to a station for Divvy, the city’s bike-share program, providing a quick and easy way to get downtown. Another, Churchill Field, is home to one of the busiest dog runs on the northwest side. Naturally, these parks are the best ways to experience the project. Another great way: Heading off the trail and wandering around some of the neighborhoods below. On a visit to the 606 this summer, I ate one of the best lunches of my life at Irazú, a Costa Rican restaurant on Milwaukee, just a few blocks north of the Bloomingdale Trail. There also are a number of great bars in Logan Square. I wrote about all of the great places to explore in an article for The Wall Street Journal. Be sure to check there for more of my recommendations before you go. Whenever you visit, remember that the Bloomingdale Trail and other portions of The 606 are an incredibly unique way to get to know the city. So get out there. Get above the neighborhoods. And get familiar.